For parents, the family computer has become something of a minefield (and probably a Minecraft field). Between guilt-tinged uncertainty about screen time for kids (“So, if you’re using it for good, does it count as screen time?”) and worry about social media stress for teens, it’s easy to feel like a lost traveler without a GPS. The nagging sense that we’re not quite steering this ship plagues educators, too, who may find themselves dropping everything to manage the fallout of interpersonal crises that play out in the digital realm, erupting with little or no warning. How can we take control? And how can we help kids manage their online time and the problems they encounter, as well as assess their own digital responsibilities? One set of useful resources comes from Project Zero research director Carrie James, a sociologist at the Harvard Graduate School of Education who studies ethics and citizenship online and works with a network of educators. According to James, we need to negotiate new terms of engagement with the digital world. In her recent book Disconnected: Youth, New Media, and the Ethics Gap, she outlines a vision for what she calls conscientious connectivity — a way of being mindful in the digital sphere, paying attention to the implications of our online behavior. Amid lessons on technology skills, coding, and Internet safety, educators and parents can help kids explore these avenues and acquire a mindset of conscientious connectivity, James says. Rather than expecting kids to know intrinsically how to navigate this strange land, we can teach them how to do it — guiding them to become good digital citizens, sensitive to the meaning of their online experiences. Ask them to think about the rings of responsibility — the ways in which they are responsible to themselves, their friends and families, and a wider circle of people unknown to them. You attend a party without your parents’ consent. A Facebook friend posts photos from the party and tags you in them. A friend texts you and 10 other people a video of a classmate changing in the locker in the room. You notice that a friend is a member of an online group whose purpose is to complain about a teacher at your school. Ask kids to identify all of the people who are involved or who might be affected by these scenarios — as many as they can think of. Ask them to consider the dilemma from all of those perspectives. Reflecting on these dilemmas, ask students to consider possible action steps: What could they do? 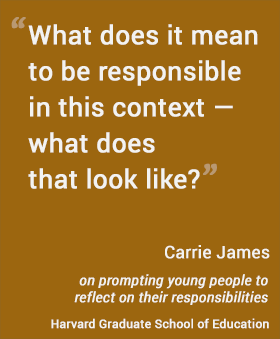 How might their actions affect the people in those rings of responsibility — the young person at the center, her friends, and the larger community? These empowering exercises, James says, can help young people raise their sensitivity to the fullness of their online experience and sharpen their ethical thinking skills. The point is to be mindful of the meaning behind our actions — and the way our online activity affects a widening community of people we know and, increasingly, people we don’t. Download the Digital Literacy and Citizen Curriculum, developed by Common Sense Media in collaboration with Project Zero research director Carrie James, Professor Howard Gardner, and a team of researchers who were part of their Good Play Project. Read Ethics, Disconnected: Helping Young People Confront the Ethical Dilemmas of the Online World.